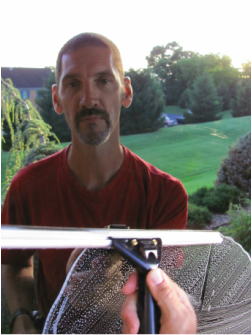 About Bob the Window Cleaner - First Impressions Window Cleaning, Inc.
After graduating from North Central University in 1994, I found myself seeking stable employment with a flexible schedule and reasonable pay. Some other jobs I tried just weren’t very rewarding or fun, then, I began cleaning windows. I received the equivalent of about twenty hours of training, my equipment and a commercial window cleaning route on December 12th, 1994 in Minneapolis, MN. Needless to say, given the climate and time of year, I learned some hard lessons early and regularly questioned if this was “worth it”. It definitely wasn’t fun through that first winter in Minnesota, however, I quickly realized that this was something I could learn to love. I remember taking the time to figure out easier and better ways to do my job that made it more fun and didn’t compromise quality or customer care. Better equipment, different approach, different time of day, were just a couple of things that made me a better window cleaner. It was in my DNA to own a business and be a window cleaner. Now, fast forward to August 1995 and I had eight months of experience, was engaged, and we decided to move to Central Virginia. We chose Charlottesville. Before our wedding on October 7th I had moved, married, and started a business in a city where we didn't know a single person. WOW! What was I thinking? I literally went business to business and established a commercial route and hired my first part-time employee in the Spring of 1996. Since then, I have enjoyed the rewards of my decisions and have been blessed with a house, long-tenured employees, great customers, an amazing wife and two beautiful children. For me, window cleaning is FUN and something I ENJOY doing each day. It's not like a job, it is so much better. When I graduated from college, I never would have dreamed this would be my “life’s work”.